Tammy Buchanan is the founder of Small Jobs Plumbing - the very first woman owned and operated plumbing company in Nova Scotia. One of her top tips is recommending that people use a toilet paper that breaks down quickly in water - helping to keep your toilets clog free. This is especially important if you have a septic system, or low flush toilets. The MAJESTA e-z flush shake test is really simple. We took 5 squares of Majesta toilet paper and put it into a bottle, added water, shook and then poured out. Then we took 5 squares of the leading brand toilet paper and put it into a bootle, added water, shook and poured out. We then compared how they breakdown - I was quite surprised at the difference. Mr. J was my helper, and you can watch the video to see the results. I am sure we are not the only parents that have found their children obsessed with flushing toilet paper down the toilet. Just last weekend (during a dinner party, no less) Mr. K decided to put an ENTIRE roll of toilet paper in the toilet, and flush. Of course, the toilet couldn't handle that much and ended up clogged. It was so bad that the plunger would't do, and hubby had to take a trip to his shop the next day to get a plumbing snake. Of course, after performing the MAJESTA e-z flush shake test today, I was wishing that we had been using MAJESTA brand last week. For more tips from Tammy, please head over and watch e-z Toilet Fixes Videos on the Majesta site. 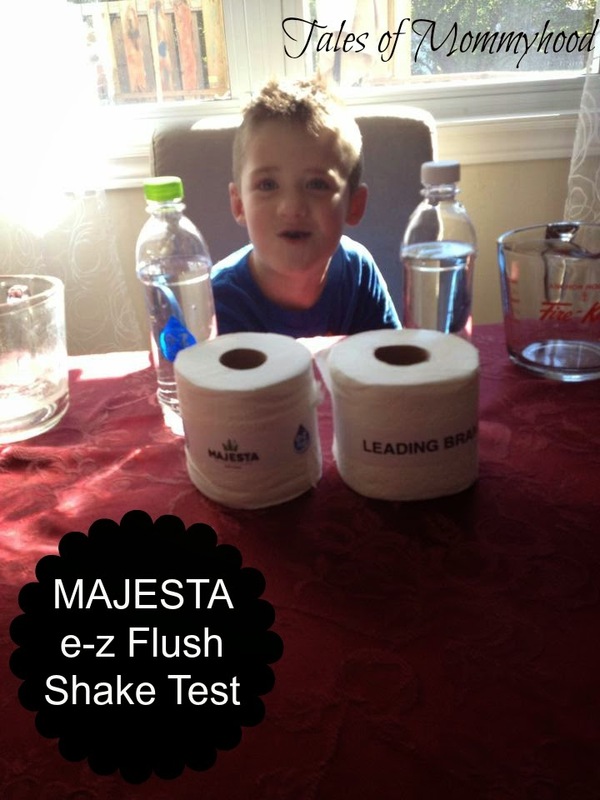 MAJESTA wants to give one of my readers a chance to try out MAJESTA e-z flush products. One lucky Tales of Mommyhood reader is going to WIN a $25.00 Visa Gift Card as well as $40.00 worth of e-z flush product! Entering is simple, fill out the form below. Giveaway will run until September 22 2014 and is open to Canadian (except Quebec) residents over the age of 18. Void where prohibited. Good luck! oh, our toilet gets blocked multiple times a week - so annoying! We had our plumbing back up a few weeks ago and had to get the tank pumped out. Luckily there wasn't much damage. we had an overflowing toilet a few time...more than annoying! It would be great to win the MAJESTA e-z flush prize pack. In response to your question of What has your worst plumbing problem been? down the toilet and they clogged the toilet. My kids poured bacon grease down the kitchen sink and it was a very messy job getting it unplugged. Knock on wood. No big plumbing issues, except too much of my hair clogged the tub. worst plumbing problem was watching my plumber I hired snaking my toliet and watching him bite his nails ewwww. My boys have used too much TP and overflowed the toilet several times. The worst time was when one of them did it overnight and I woke up to a soaked bathroom and hallway on a day when we had to be out the door by 7AM. Nothing yet thank god! That will likely change once my baby is a toddler! Backed up toilet was the worst for me. Our toilet over flowed and we had to use a snake to clear it. Eww, it was yucky! The kids putting to much toilet paper in the toilet. My brother used to overload the toilet with toilet paper. There was an awful lot of unnecessary plunging. only one, thank goodness, and that was a superhero blocking the toilet. Definitely an over flowing toilet!! My worst plumbing problem I've experienced has been a clogged toilet. This house...the plumbing is awful. We can flush (after the boys go pee, NO toilet paper in the toilet) and it will plug. We're plunging at least once day here. My daughter who is now 22, she tried to flush Barbie, and about everything else she could get her hands on.. she loved watching the water go round and round and disappear. Needless to say, the day we saved Barbie.. we saved a pencil and a hot wheels too! When my son was little he flushed his diaper (or tried too) and flooded the bathroom. When the cities tree roots were growing in the sewer Libes leading up to the house. When there was no where for the toilet/sink sewage to go it came up the pipes in yhe garage. Wow what a mess. It happened more then once and they had to dig up the driveway and didn't replace it as nice as it was! We have kids and a septic system, need I say more. I'm always worried that something will get in there and cost me $25,000! My little man always uses way too much toilet paper, seriously we go through way too much. the worst was when he was really sick at around 1am! up at that hour with a plunger, NOT so fun! I have never had a really bad plumbing problem here. We have to hold the handle down to get all the tissue down...sometimes even a double flush lol! We have had a few clogged toilets and the handle broke a few times. I once flushed some cat litter down the toilet - the resulting superclog and back-up was not pretty! My worst plumbing problem isn't really much of an issue, as I went to college for plumbing. I would say leaky or clogged drains are the worst though - what a mess! We had a clog in the kitchen drain that took multiple plumber snakes to resolve - washing dishes in the bathtub was a problem! My son flushed an entire roll of toilet paper down! worst has been a blocked up toilet, had to put a new toilet in. We had some leaking around the toilet and had to change out the seal. Toilet brush broke and got caught in the toilet. Have to replace the toilet. I put too much toilet paper in and plugged up the toilet. YUK! my youngest insisting on using a roll of toilet paper each time he is in the bathroom..
my son is always dropping rolls of toilet paper down the toilet and once he flushed!! The usual toilet overflows because too much toilet paper was used. After reading some of the above posts, I think I've been lucky! We have a new toilet now, but before the water used to run on. The flapper had to be replaced. The flusher on our toilet stopped working and the part took 6 weeks to get in so we had to flush the toilet by pulling the lever inside the tank for two months. I haven't had a worst yet, besides dropping my daughter's little pony into the toilet. My son has a problem with using toilet paper because he's scared the toilet will clog. 3-ply toilet paper seems to always cause a problem. Clogging the toilet with a stool that was way to big to flush. I am fortunate not to have had any major plumbing problems. Our homestay student has been dubbed the "Toilet Killer" ..
My worst plumbing problem was years ago when we had a weeping willow tree with the roots growing into the plumbing. When I cleaned the kitchen drain it somehow backed up into the bathtub -- yuck!!!!! My worst plumbing incident was when I found our two year old trying to flush all our toothbrushes down the toilet. He was successful with two before I found him. I would love to win the Magesta e-z flush prize pack.This is an awesome giveaway. My worst plumbing problem was when the toilet over flowed and ruined our newly laid click flooring.I almost cried. Ours was just an overflowing toilet that my daughter kept flushing when it was plugged. 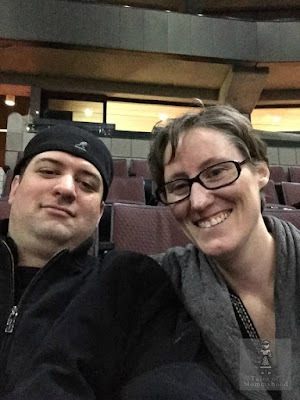 The worst part was that we were about to put our house for sale and I was worried that there was going to be water damage that we would have to deal with first but it turned out to be fine. At our house we are good but at the lake we have to dump the septic tank and its gets plugged up with toilet paper so we have to use a special kind and very little and lots of water.